You've probably had to say more than once, "Don't make me angry. You wouldn't like me when I'm angry." And we don't blame you. It's a rad line. It's even been used around our office a couple of times. But have you always felt like there's not much backing it up? Like the people you use it on are expecting you to turn into a giant green rage monster... and you can't deliver the goods? Dr. Bruce Banner sure could when he used his famous line. And now so can you with the Deluxe Adult Hulk costume! Just speak the magic words, run off for a quick change (or just rip off your "Bruce Banner" clothes if you're wearing your Hulk costume underneath), and presto! You're automatically the toughest member of the Avengers... and the most fearsome comic book superhero at the Halloween party. You could even give the boy in blue a run for his money (we know, we know--different comics. But still). We would say you'll make the other partiers green with envy... but we know you don't like lame puns, so we totally won't. This awesome outfit comes with the whole "Hulk" package. it's a one-piece polyester jumpsuit that gives you that signature look, green skin and shredded purple shorts included. Best of all, it comes with a padded chest that'll give you Hulk's famous muscles, and a wig tops the whole thing all off. 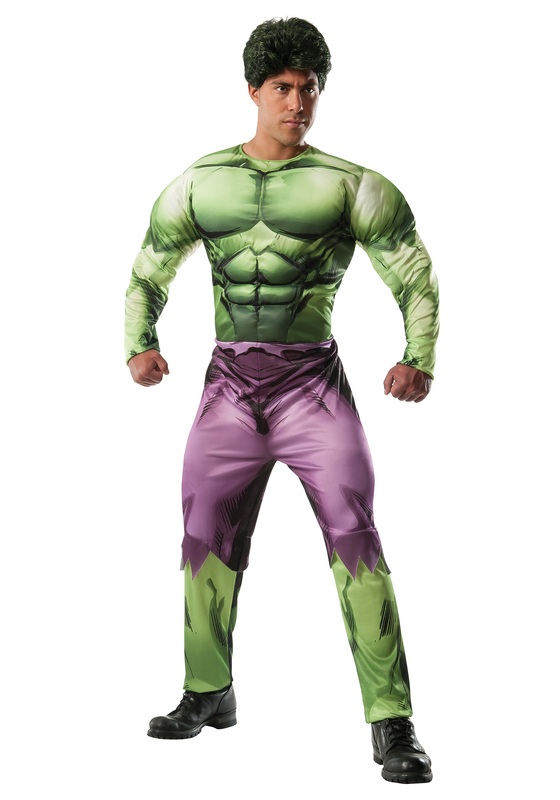 In the Deluxe Adult Hulk costume, you're sure to be someone people won't want to make angry this Halloween!